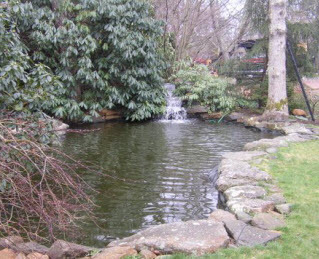 Fragosa Landscapes is a local family owned business, and we have been proudly serving the island of Martha’s Vineyard since 1975. We provide quality Organic Land Care and are the exclusive dealer/applicator of the BeeSafe Land Care System. Bring out your home’s beauty and create the environment you can be proud of. Our services include Landscape Design and Installation, Irrigation Systems, Property Maintenance and Restoration, Fields and Pasture Maintenance, Tree and View Work, Organic Flea and Tick Yard Guard, Large Trees & Shrubs and much more. Call Us Today for a free consultation to find out how we can help. Whether you are looking for new landscape installation, or maintenance we are your quality choice! We look forward to working hard to help make your house a home. Our Quality is Always higher than our prices. 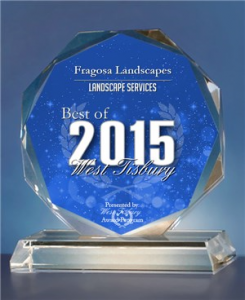 Fragosa Landscapes has been selected for the 2015 Best of West Tisbury Award in the Landscape Services category by the West Tisbury Award Program. Each year, the West Tisbury Award Program identifies companies that we believe have achieved exceptional marketing success in their local community and business category. These are local companies that enhance the positive image of small business through service to their customers and our community. These exceptional companies help make the West Tisbury area a great place to live, work and play. Various sources of information were gathered and analyzed to choose the winners in each category. The 2015 West Tisbury Award Program focuses on quality, not quantity. Winners are determined based on the information gathered both internally by the West Tisbury Award Program and data provided by third parties.